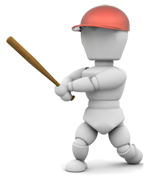 Welcome to Yosemite Physical Therapy's patient resource about baseball. Baseball is the all Canadian and American past time and it is definitely the game of summer. There is nothing better than the crack of the bat, the cheer of the crowd and running the bases after you have hit one out of the park. The best and most exciting baseball is played by some of the most well trained athletes on the planet. Now, it’s not a coincidence that these guys are at the top of their game, after all, they know how to properly condition and train themselves. Baseball doesn’t have a lot of contact between players, but nevertheless, there is repetitive motion when it comes to throwing, hitting and base running. Therefore, players must be conditioned properly and all practices should focus on these exercises. We are here to be a reference point for you, learn about the exercises and stretches that can help with your game and keep you batting 300.